I feel like I’m back in my ‘elephant’ as one of my friends always says. I’m sitting on a long distance train with no internet connection drafting blog posts about stations, journeys and destinations. This time I am not on an Amtrak train, but a Eurostar train which has just left London’s St Pancras Station and is travelling along the tracks known as HS1 (High Speed 1) from London to Folkestone via Ebbsfleet. Once again it sports a stunning roof arch, not dissimilar to the one at Paddington Station. It was opened in 1868 (14 years after Paddington) and at the time was the largest single span roof (Paddington’s is a three span roof – a wider roof in total, but separate spans). 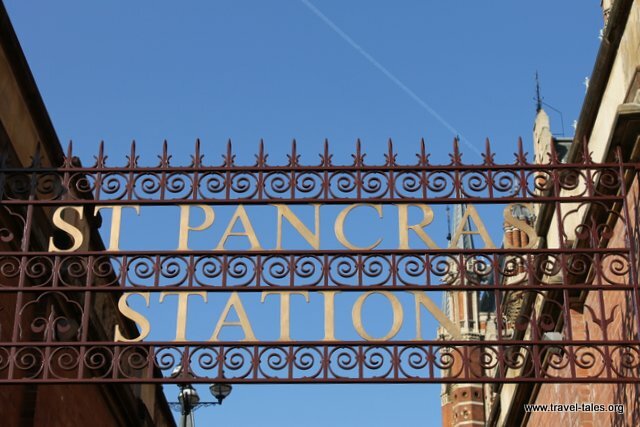 It remained empty many years after his successful campaign and was reopened in 2007 after a restoration creating the Terminus for international Eurostar services. The main building now houses a Renaissance Hotel and the concourse shopping rivals Bond Street with the luxury brands represented.